These versions bring 2x-6x reduced CPU usage and better battery life for such devices. You can install the Intel optimized version on devices with the 'Intel inside' logo. It will not work on regular ARM-based devices, and if you install these you won’t be able to install a regular (ARM) version without full reinstall and settings loss. For regular Android ARM versions, click here. Archived copies of older releases are also available if you wish to roll back to a previous version for any reason. Caution should always be advised when rolling back any software, just in case new settings or features may have been added which may no longer be compatible with older versions. 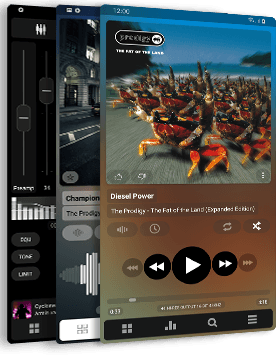 Poweramp 2.0.10 (build 584) for INTEL-based Android devices. Poweramp 2.0.10 (build 581) for INTEL-based Android devices.